Where possible, samples should be loaded in capillaries for data collection. This section describes how this can be done. 1. What size capillaries should I use? It is normally recommended that users use 0.3 mm low X-ray absorption glass capillaries; the angular resolution is optimised by using as small a diameter as possible. Capillary sizes >0.5 mm are not recommended. 2. How much sample do I need? For ease of experiment set-up, the length of sample needed in the capillary is usually 15-20 mm (or more), above the brass stub holding the capillary. However, if only a small amount of sample is available it is possible to work with as little as 3-5 mm of sample, if care is taken when positioning the sample. The location of the beam on the sample using the two sample mounting options available is shown in Figure 1. NOTE: samples prepared for use in conjunction with the cryostream and hot-air blowers must be long. To seal the capillary break off the funnel, and any excess capillary, and seal it at least 10 mm away from the sample. Figure 1. 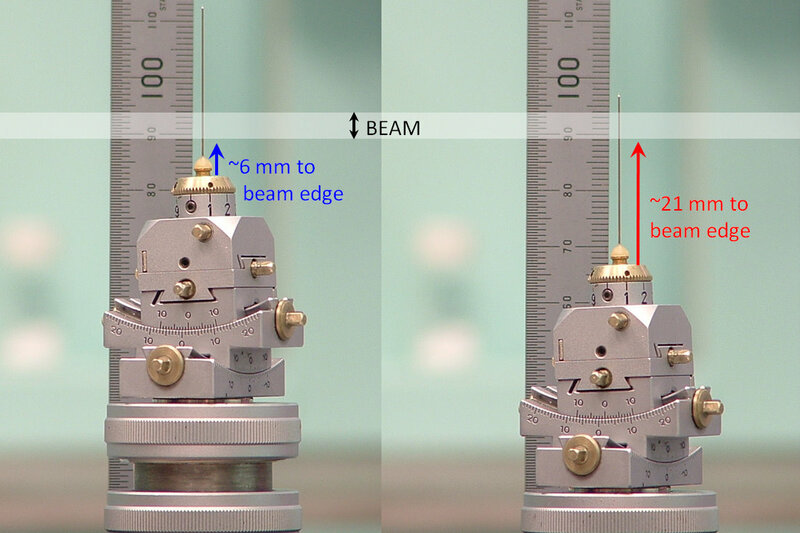 Photographs showing the distance between the goniometer head to the edge of the X-ray beam for short samples (left) and for long samples (right). 3. What type of capillaries should I use? Most low- or ambient-temperature experiments will use 'special glass' or 'borosilicate' capillaries', but high-temperature experiments will require 'quartz' capillaries (these can be used up to 1370 K). 4. Where can I purchase suitable capillaries? Capillaries can be purchased from Charles Supper or Hilgenberg and will take at least two weeks to be delivered (for standard stock items). For non-standard thicker-walled quartz capillaries, users will need to contact Hilgenberg directly for pricing and availability. Delivery time might be longer. 5. How do I pack sample in capillaries? Load only the smallest amount (<1 mm deep) of material into the capillary funnel at any one time - otherwise the sample becomes stuck pretty early on in the capillary. Vibration is the key to moving the sample down and a good light source behind the capillary is needed to see whether the sample has moved down the capillary and/or is coating the sides of the capillary. Vibration can be achieved by running a small, fine file across the capillary (while holding the capillary lightly between your fingers); or by 'dropping'/tapping the capillary on a hard surface, e.g. use a narrow tube of at least 15 cm length which the whole capillary will slide through and drop the capillary into the top and let it land on a bench top (this is a repetitive process); or by standing the capillary upright in a beaker or similar container, and placing this in a sonicator; or finally, if you have a vibrating hand held tool you can hold it to the capillary and get the sample to shuffle down. If it has not been possible to load sample in a capillary, it may be appropriate in certain situations, to adhere the sample to the outer wall of the capillary using Vaseline. 6. What about capillaries at high-pressure? Capillaries can be pressurised during in situ measurements. It is mandatory that thick wall (0.02 - 0.05 mm) quartz capillaries are used for experiments where internal capillary pressures above 5 bar are expected. For experiments requiring pressures: 5 - 10 bar, quartz capillaries with a wall thickness of 0.02 mm are required. For experiments requiring pressures: 10 – 20 bar, quartz capillaries with a wall thickness of 0.05 mm are required. These capillaries can be specially ordered from Hilgenberg. For all high pressure capillary experiments using either the Norby or flow cell, the maximum pressure allowed is 2 MPa (20 bar). Higher pressures are possible by prior agreement with beamline staff, however sapphire capillaries will be required. Please note that for any high pressure gas experiments above 5 bar with inert gases (at any pressure with flammable gases), there must always be 2 persons present at the beamline to monitor the capillary and ensure that breakages are detected as soon as they occur. Hints on the preparation of samples for furnace experiments are provided by Anton Paar and are available here. Additional information regarding the reactivity of samples with platinum is available here; this information should be read carefully, well in advance of the proposed experiment. The Stoe capillary furnace (NEW) is capable of heating quartz capillaries from room temperature to 1370 K and will be available from round 3 in 2012. The samples are heated using graphite furnace inserts specifically sized for different capillary diameters: 0.3 mm - 1 mm. Normal thin-walled capillaries (10 μm) can be used and the capillaries are rotated to improve powder averaging during data collection. To ensure that the sample is in the beam, the capillary must be filled to a depth of 2 cm from the sealed end. There is no need to break off the funnel or shorten the capillary as the full length is required to ensure the capillary is properly housed in the furnace. Machine multi-well sample cassette; instructions for the plate's manufacture are available here. • Cassettes may be 0.5, 0.8, or 1.2 mm thick, however, thicker samples must be used with caution due to the absorption issues that may arise. Adhere kapton or mylar to one side of cassette, taking care to avoid impinging on a 5 mm border around the edge of the cassette. Polymer film (kapton or mylar) should not exceed 25 micron thickness. • It is difficult to obtain commercial films thinner than 25 microns with adhesive backing. Thinner films are available (without adhesive) and can be fixed to the cassette using a thin coating of spray adhesive. • Films that are 6 - 12 microns thick have demonstrated both robustness and acceptable levels X-ray absorption. • Films can be purchased locally from http://www.sietronics.com.au/xrffilm.html and spray adhesive is available at office suppliers. Place samples in wells. This can be achieved using a very small funnel or a disposable plastic pipette tip. Take care not to press the powders into the wells using spatulas or other flat instruments as unwanted crystallite orientation may result. Powders will need to be finely ground so that the particle size is no more than 10 microns in diameter. • Eppendorf pipette tips are suitable for loading samples into wells. Adhere kapton or mylar to the other side of the sample cassette, taking care to avoid impinging on a 5 mm border around the edge of the cassette. • Minimise cross contamination of sample wells by sealing single or groups of completed wells as you go. Figure 2. Photographs of the stages of filling the high-throughput sample casette. Samples are mounted in the cryostat within the sample holder (Figure 3) which can hold up to three samples at once. 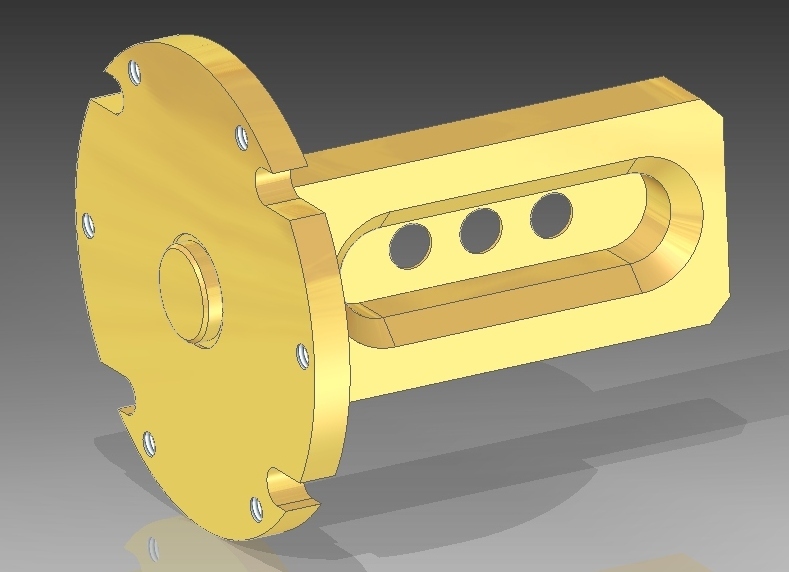 The samples will be in flat transmission geometry and sealed in each position with Kapton film. Sample changeover requires venting the sample chamber, dismantling the cryostat and then reassembling and pumping down the system after the samples are changed. It is expected that this will take approximately 90 minutes so time should be set aside for this procedure in your experimental plan.